The guys at NetEnt HQ have been busy lately, and this is one of the many new fruits they’ve harvested. 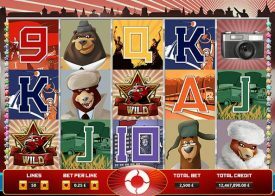 The game is a simple 30 win line pokie, however, you can activate the All Ways feature by wagering an additional bet meaning that all as long as 3 or more symbols spin into view from left to right you’ll win! The game will also award up to 50 free spins which use a special reel set making it even easier for you to win big. 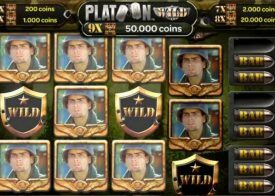 There is a wild symbol and also a sticky wild feature in the free spins bonus round which makes this one of the better paying pokies on the net. 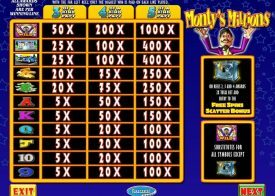 When playing you have the option of playing for various coin denominations, and also various lines, so if you don’t fancy a 30 win line pokie playing experience you can play for as many, or as few win lines as you like, this also makes the game accessible to anyone whether they’re a low roller, or a high roller, or anything in between. The jackpot is rather generous also, and being a NetEnt pokie game, you’ll find it actually spins in fairly often. The only real way for you to determine whether you are going to enjoy playing the Alien Robots Pokie game will be for you to set a little bit of time to play it, and you can do so for free or for real money at any of our featured online casino sites, so you have no excuses not to test it out and get stuck right into playing it for free! 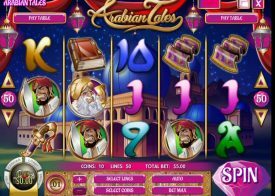 However, if you haven’t got a little of spare time to test this pokie game out online either for free or for real money then please read on for by doing so you will then get to discover all of the unique features that makes this pokie one of the more exciting and entertaining pokie games currently available online and we think you will love playing it! There are bound to be a huge number of questions you may have about the Alien Robots Pokie machine and to help you make sense of how this NetEnt designed Pokie plays and pays we have the following frequently asked questions and answers section of our review of the Pokie. What is the payout percentage of this pokie? 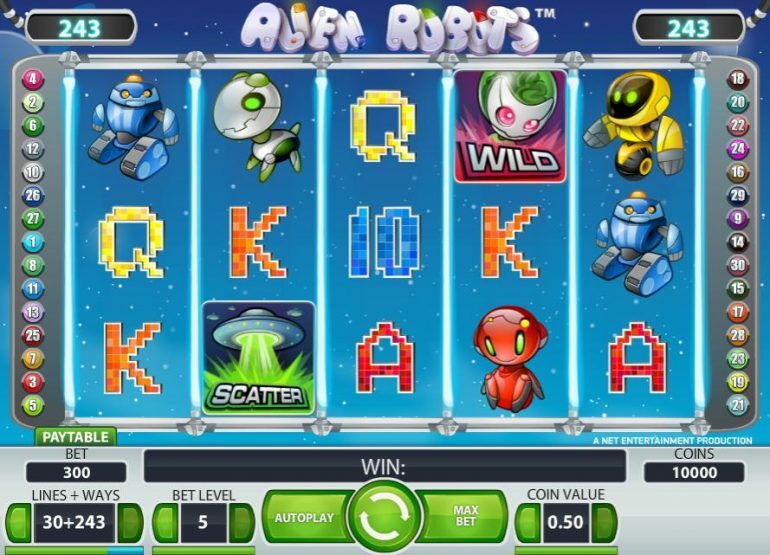 The Alien Robots Pokie game is going to be one you will enjoy playing and one thing that is worth knowing about this Pokie game is that is has a high payout percentage and if you are wondering just what is the payout percentage then we are happy to let you know this pokie been sent to return 96.40%. What option settings are available? When you set about playing Pokie machines you will find that before you actually send the reels spinning on any of them you will be given a range of different option settings, when you decide the time is right to play this particular Pokie machine online you can set the reels to spin and stop much quicker than in normal play via the quick spin option setting. How can I get more playing value? We want you to get the maximum value when playing Pokie machines anywhere in Australia and whilst you may wish to visit a land based casino you will find there are way more generous comps to be had when you play this Pokie machine at or licensed and regulated online and mobile casino sites which in turn will see you getting more playing value from your bankroll! Is this Pokie game suitable for low rolling Pokie players? We do know that many pokie players want to have the enjoyment of playing pokie machines online but only wish to play for low stake amounts and that is something that NetEnt know too, and as such you will be able to configure the coin value settings on this Pokie machines down to a very low one cent, so low rollers will always be able to play it online!